Critiques crush, yet . . .
Rejections rain, yet . . . Naysayers speak, yet . . .
Self-doubt hovers, yet . . . I shield this self-doubt with my mantra. As an aspiring children’s writer, I’d like to proclaim my mantra written by a famous somebody like . . .
A.A. Milne: You can’t stay in your corner of the Forest waiting for others to come to you. You have to go to them sometimes. Frances Hodgson Burnett: At first people refuse to believe that a strange new thing can be done, then they begin to hope it can be done, then they see it can be done– then it is done and all the world wonders why it was not done centuries ago. Louisa May Alcott: I am not afraid of storms, for I am learning how to sail my ship. But no, my mantra comes from the elusive ‘Anonymous’ which, I admit, leaves me a bit unsettled, but nevertheless, it resonates: Today’s mighty oak is just yesterday’s nut that held its ground. This mantra, which I chant during times of doubt, inspires me to continue . . . tap, tap, tapping out my dreams. And then one day, I notice . . .
hurdles, which once seemed large, begin to crumble. Critique partners rave. Authors compliment. A #1 is received from Rate Your Story! Rejections are personalized. Editors email. 468 of you kind people follow this blog. Hope is in the air! Though publication continues to elude me, I think it’s safe to say: this nut has cracked; a sprout shoots upward! All words and photos property of Peacock Prairie. Love this. All nuts shall stand together! Thank you, Julia, for sharing your beautiful words and images. Thanks, Jill. This nut looks up towards you. Keep holding your ground nut. You are part of my e-tribe. Your words are important to me. Chin up PP. Yes, Val, you are right. Thanks for the nice comment. As always – so beautiful! Yay for perseverance! You will succeed! You never cease to amaze…..
YOU, my dear, are the one who amazes me. The more I get to know you the more I want to be like you. A gorgeous post! I’m delighted you are continuing to persist. If you have written a children’s book, to me that makes you an author of a children’s book (rather than an aspiring author). That it remains unpublished is a mere detail. After all, you could publish it yourself if you wanted. The barriers to do so have never been lower. Whatever you decide, I wish you much success (however you define it) and may your adventure be full of blessings. Thank you, Russ. Wise words to remember. It is coming! I can feel it! Keep sharing your beautiful words and pictures and you will feel it too! Thanks for your belief, Lynne. Please don’t stop tap, tap, tapping. I really enjoy reading your blog. Thanks Becky. I’m glad you enjoy, sweet sister. I needed to hear this today, too. There’s always more than enough rejection to go around. The best part of rejection — you’re getting out there, you’re not stuck in your part of the forest waiting for others to do the work. Keep going! Hi Brenda, I’ve recognized a pattern to my reaction to rejection. At first, I think: That’s ok. It wasn’t meant to be. But later, especially if it was someone I felt was a good match for the manuscript, the self-doubt sets in. As time goes on, I am learning to recognize the self-doubt as a passing thought soon to be followed by added determination. It gets easier but never easy. Thanks for reading. I have plenty of self-doubt, but it coexists, mostly peacefully, with determination. A refusal to let anyone else decide my fate. 🙂 Remember, even Jane Yolen gets rejected. Amazing photography! 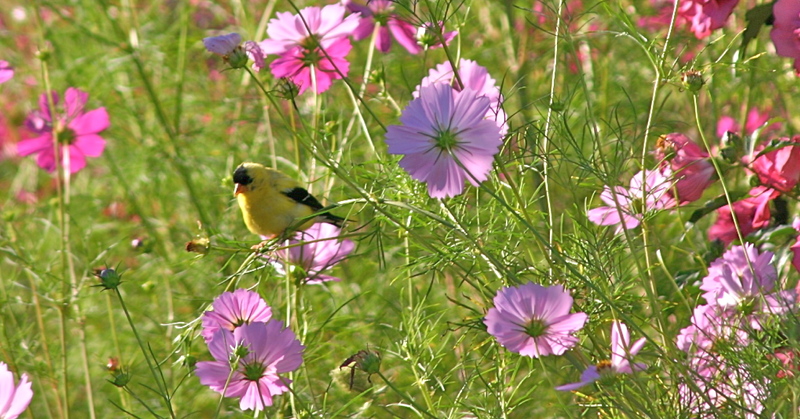 I love the bright flower, insects, birds, storms and all that is there. You just made my day! Hello, What a pretty name you have chosen for your blog. I love to sit and dream in the daisies. Thank you for your visit and kind words. Never give up, my friend. Hey Julie, If I were a frog in your pond, you would hear me happily peeping away. Thanks so much for the sweet comment. I love, love, love each and everyone of your photos! As one NUT to another. Thank you, Kelly. You are right about enjoying the journey. I, too, need to remind myself of that at times. Happy day to you. We can all remind ourselves to enjoy the journey together… one of the perks of having friends at our fingertips, right?! I love your photography and writing. I’m glad I stumbled across your blog. This entry in particular resonates with my recent feelings as a writer. The photos also remind me of a relevant quote from the movie Adaptation: “…Every one of these flowers has a specific relationship with the insect that pollinates it.. I mean, how could they know that because of their little dance the world lives? But it does. By simply doing what they’re designed to do, something large and magnificent happens. In this sense they show us how to live – how the only barometer you have is your heart. How, when you spot your flower, you can’t let anything get in your way.” The movie was referring to romance, but I think it applies to our intellectual passions too. Thanks for writing. Hello, Thank you for sharing your lovely thoughts– “because of their little dance the world lives”, “when you spot your flower, you can’t let anything get in your way.” I LOVE that. Thank you for sharing your thoughts.